Note: While these files have been declassified and available to the public for several years, I have not seen them assembled into any sort of easy to download files. 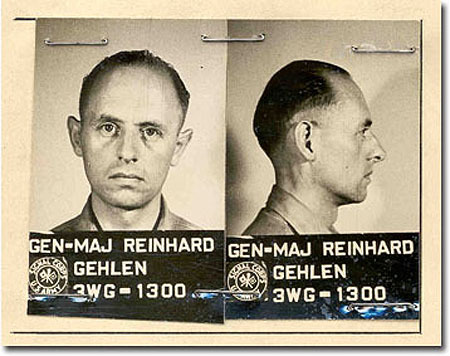 These 2,000+ pages, split into seven volumes, comprise the declassified portions of the Central Intelligence Agency’s (CIA) file on General Reinhard Gehlen, the Nazi intelligence chief who served many masters, including the CIA. GENERAL Reinhard Gehlen, perhaps one of the most important people in modern American history that few have ever heard of. While his influence was covert, it was of no less force. The Nazi intelligence chief who served many masters including Adolf Hitler, NATO, and the United States Government. His intelligence reports on the Soviet Union during the formative years of the Cold War were used to shape American foreign policy. During World War II, Gehlen was made chief of Fremde Herre Ost (Foreign Armies East), Nazi Germany’s military intelligence unit on the Eastern Front. He was able to reach the rank of Major-General before being fired by Hitler in 1945 for his accurate, but pessimistic, reports on the Red Army. However, early on he had sensed that Germany might not win the war, and so he had all of his intelligence documents microfilmed, placed in steel drums, and buried in the Bavarian Alps. It would later be these files that would save him from imprisonment and the war crimes trials. In 1945, Gehlen surrendered to The Army Counter Intelligence Corp (CIC), and upon interrogation, he offered up his files and network of spies to the United States in exchange for his freedom. The files were dug up, his men in the Allied POW camps were transferred, and he was flown to Fort Hunt in Virginia in secret. It was there that a deal was hammered out for Gehlen to return to Germany, re-establish his intelligence network, and serve the United States Government. Thus the Gehlen Organization was born. The Gehlen Organization, or the “Org” as it was referred to, was then grafted on to the fledgling CIA at its creation in 1947, and it was often the only eyes and ears on the ground in many Soviet bloc countries after the war. It was through the Gehlen Organization that many hundreds, and perhaps thousands, of SS, SD, and Gestapo men came to work for the United States Government. It was the intelligence reports from these Nazi men, that wound up comprising an estimated 70% of all U.S. intelligence on the Soviet Union during the early part of the Cold War.